FDOT is constructing a replacement for the Pensacola Bay Bridge that carries US 98 (SR 30) traffic over the bay and connects the cities of Pensacola (in Escambia County) and Gulf Breeze (in Santa Rosa County). US 98 is a significant east-west transportation corridor in the region and is also primary hurricane evacuation route for the Northwest Florida coast. The current bridge has been deemed structurally deficient. Though it is safe for continued use, it is nearing the end of its life span. Traffic projections indicate that three lanes of traffic in each direction will be required to meet the minimum level of service criteria in the design year 2040. An FDOT life cycle cost analysis indicates that replacing the bridge is a better alternative than widening or rehabilitation due to the cost of maintaining the aging structure. When complete, the $398.5 million project will increase safety and improve traffic flow for the estimated 55,000 drivers who travel the bridge each day. 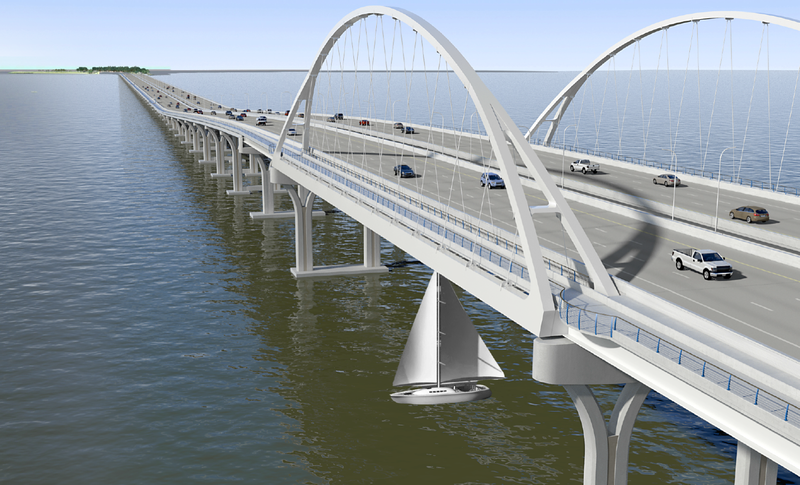 Sign-up for project updates at http://www.pensacolabaybridge.com/sign-up-for-project-updates. Note: All information is preliminary and subject to change without notice.